Jeffrey Scott Boll, a longtime resident of Ketchum, Idaho, passed from this life Friday, Jan. 25, 2013, as a result of a stroke, with his farther, Virgil, and mother, Karen, by his side. He was surrounded by many loved ones in the days before his passing. Jeff was born in Wichita, Kan., on Sept. 18, 1962, to Virgil Boll (Patricia) of D’Hanis, Texas, and Karen Goldberg of Wichita. In addition to his parents, Jeff is survived by his sister Valerie Wilson, brother Donnie Vaughan, brother Zachary Goldberg and sister Whitney Goldberg, all of Wichita, and brother Joshua Boll and sister Alexa Boll, both of D’Hanis, Texas. Jeff graduated from Wichita Southeast High School in 1980 and attended the University of Kansas from 1980 to 1984, as a member of the Sigma Chi fraternity. Jeff married his high school sweetheart, Carol Gaudreau, in 1984, and the couple moved to Sun Valley, Idaho, in 1988. They were married 23 years. In addition to family, Jeff had many friends, notable college friend Kevin Nichols and his wife, Dianne, who were particularly close and also living in Ketchum. Jeff was an accomplished tennis professional while living in Houston, Texas, from 1984 to 1988. 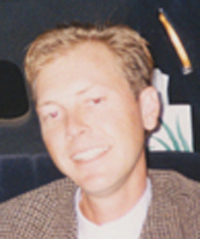 Jeff loved cars, hiking and was an avid skier, enjoying years of skiing on the slopes of Bald Mountain. Jeff will be greatly missed and remembered by his family and many friends as a free-spirited, engaging and giving man. A memorial service will be planned in Wichita at a later date.